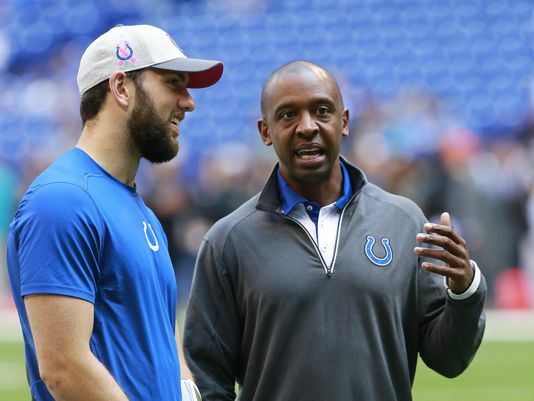 Even when Pep Hamilton was a quarterback at Howard University, his coach, Steve Wilson, saw a future coach from the way he asked and answered questions in the quarterback room, how he understood defenses and his ability to convey concepts to his teammates. Hamilton last week was officially named Michigan’s assistant head coach and pass-game coordinator, rejoining coach Jim Harbaugh, who had hired Hamilton at Stanford to coach receivers in 2010. He has more than 10 years of NFL coaching experience and most recently was the Browns’ associate head coach on offense. He replaces Jedd Fisch, who left Michigan after two seasons to become UCLA’s offensive coordinator. “I would think we’re going to play tough, smart Michigan-style football, and that’s one of the many things I’ve learned from coach Harbaugh over the years, that if you can control the line of scrimmage it’s going to open big plays for you in the run and the passing game,” Hamilton, 42, said last week in an MGoBlue.com video. Hamilton’s given name is Alfonza, but he’s always been Pep. “We didn’t even know he had another name,” Wilson said, laughing. He likely would be in the banking world right now had it not been for Wilson’s persistence. After graduating in 1997 with a business degree from Howard, where Hamilton was a two-time winner of the school’s scholar-athlete award, he had a job lined up at Bank of America. Wilson offered him a position as a graduate assistant. The banking career still appeared to be a go. A week later Wilson offered him a job as a full-time assistant, and the bank was willing to hold off a few months to give him room to sample this other career. Coaching was a go. “Pep had a coach’s mind while he played. It was easy to see,” Wilson told The Detroit News. “He helped me in just so many ways with all of my quarterbacks. He was a coach long before he became a coach. “He had some other options. I knew being the type of guy he had been around the football program, he had a bright future in football, but I knew he could have had a bright future in business, too. He’s a smart man, who always has been able to communicate well with others and can command respect. Ted White set quarterbacking records at Howard in part because of Hamilton’s assistance. White threw a record 92 touchdowns and accounted for 9,845 offensive yards and played five years professionally. While Hamilton is now known more for his work with NFL quarterback Andrew Luck, White in many ways was the first quarterback he helped shape. Hamilton grew up in Charlotte a huge Michael Jordan fan and was point guard on an AAU team that included Jeff Capel, now on the Duke staff, that won several state titles. But he loved football and studied the game. Wilson found Hamilton asking questions he had never received from a player. Wilson had been an NFL defensive back who played for Tom Landry in Dallas and with quarterback Roger Staubach and then won two Super Bowls in Denver with John Elway at quarterback. His father played with three Hall of Fame quarterbacks, and although Wilson played defense, he understood how vital it was to have a well-seasoned quarterback. He got into coaching because Landry encouraged him and stressed he should coach a position even as a head coach. Wilson sees himself as part of Hamilton’s coaching lineage, but mostly as the man who showed him there was a future for him in the profession. “When you look at his resume, his resume is a who’s who of football,” he said. Hamilton, in his MGoBlue interview, said his job is to make his players the best they can be. He inherits quarterback Wilton Speight, who helped lead Michigan to a 10-3 record last season in his first year starting, and backups John O’Korn and Brandon Peters, along with incoming freshman Dylan McCaffrey. And to reach that point takes great quarterbacking, as Wilson always preached.